Well, this certainly took me a long while to get finished. I've mentioned before the fact that I was up to my eyes in essays, but still, this was a bit of a slog. Taking out the panic factor, I'll try explaining below. This is usually the part where I outline the book's plot, in a spoiler-free way. I can't really do that here. 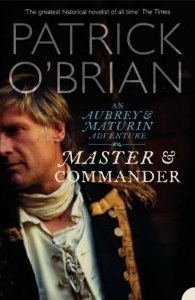 Not because Master & Commander has a lot of twists and turns like Invisible Monster. Rather, I can't explain the plot because it doesn't really have one. The best I could do would probably be to say that it's a record of the first few cruises that Captain Jack Aubrey and his surgeon Stephen Maturin experience together. Otherwise, there really is no over-arching plot thread: instead, it feels more like a set of short stories involving the same characters strung together in chronological order. That leaves me in a strange position. Part of me really wants to take away something more over-arching and lasting, so the plot structure irks me as a result. Another part of me then steps in and says that I'm being silly: it's truer to life and it's not as if it's badly written, so what am I complaining about? The result of this conflict is that, basically, Master & Commander's plot leaves me completely cold. But that by itself wouldn't bother me, so long as the characters were good. Which is where another problem comes in. The characters feel a bit flat. Of course, Aubrey and Maturin feel nicely fleshed out and identifiable, if occasionally blindingly stupid in Aubrey's case. But then that's to be expected: if you can't flesh out your main characters, you've automatically killed your novel's appeal. My problem was that there's only one other character that I can think of who was really given any actual character. To me, it felt like there were a ton of names being thrown about, only a few of which I could actually identify. Even if I did manage to identify them, they had maybe one trait that differentiated him from any other person onboard the ship, so identification wasn't really all that helpful. It just feels really frustrating, because I know that O'Brian can do good characterisation, as evidenced in his main characters; it just feels like he couldn't be bothered to extend that to the rest of the crew. My other main gripe is a technical one, and is probably very easy to overcome if you aren't trying to finish a degree at the same time like I was. The book is quite fond of naval terms and the only help given by the book itself was a little guide at the front naming the different sails. The sails were not the things usually talked about in complex terms. Everything else was, just not the sails. I suppose that that's why Maturin was included, as he is a surgeon unfamiliar with naval terms and procedures when the book starts. The problem with that is that presumably Maturin has visual help, which the reader doesn't, so there's an automatic disadvantage. What really doesn't help is that Maturin stops asking questions about halfway through, so if you're still struggling with the terminology, you're just sort of left to wallow.